The Alfa Romeo 4C arrived in 2015, marking the brand’s return to the mainstream US market after a 20-year hiatus. Mentioned in the same breath as cars from Porsche and Lotus, the 4C is a lightweight sports car that carries quite a presence. For 2019, there are several updates. By now, the 4C’s shape should be familiar among the enthusiast set, but that doesn’t make it any less striking. Previously, it was available in hardtop Coupe and convertible Spider body styles, but for 2019, Alfa nixed the Coupe. Still, the Spider stretches well-placed curves and classic proportions across a lightweight carbon fiber body (in fact, the entire car weighs less than 2,500 pounds). Inside, there’s a minimalistic, yet functional, interior with space for two. But road-trippers should be advised that total cargo capacity is a scant 3.7 cubic feet. The 4C’s powertrain is where much of the magic happens, consisting of a mid-mounted 1.7-liter turbocharged inline 4-cylinder engine paired to a 6-speed sequential-automatic transmission. All 237 horsepower and 258 pound-feet of torque is sent straight to the rear wheels, and drivers can choose any of four modes from the DNA Pro drive mode selector. The 4C will hit 60 miles per hour in 4.1 seconds, hit a maximum speed of 160 miles per hour, and run to a 6,500-rpm redline. Fuel economy for the 4C is 24 mpg city, 34 highway, and 28 mpg combined. The 4C Spider offers 18-inch alloy wheels, leather upholstery, air conditioning, LED daytime-running lights, LED taillights, keyless entry, an auto-dimming rearview mirror, a 7.0-inch instrument cluster display, and an AM/FM radio with USB connectivity. From there, you can choose several standalone options. New ones for 2019 include a race-tuned suspension, a microfiber steering wheel, carbon fiber mirrors, and carbon fiber Italian flag mirrors. The Convenience Group Package from earlier years has now been made standard, throwing in a reversing camera, reversing sensors, and cruise control. The Alfa Romeo 4C comes with nearly a century of racing history behind it, creating a striking impression, both for the driver and for onlookers. Even though Alfa Romeo has discontinued the hardtop Coupe model, there’s still plenty of fun to be had with the convertible Spider. 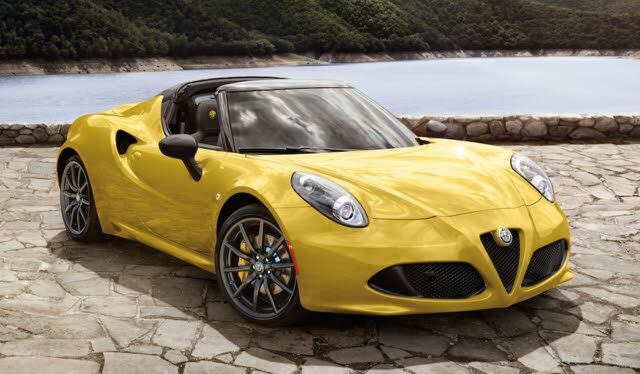 What's your take on the 2019 Alfa Romeo 4C? Have you driven a 2019 Alfa Romeo 4C?